Contemporary French philosophy perhaps reached a high point during the 1970s with the likes of Gilles Deleuze, Michel Foucault and Jacques Derrida. Since that time, thinkers such as Francois Laruelle, Bernard Stiegler, Quentin Meillassoux and Catherine Malabou have continued on in this strong tradition, while deepening and rethinking many of the parameters that have made contemporary French philosophy so powerful and useful for understanding the contemporary condition. For example, new French thought has reengaged with the relationships between thought, science and universal commercial interests, and has investigated purposefully the possibilities of post-capitalist theorising. 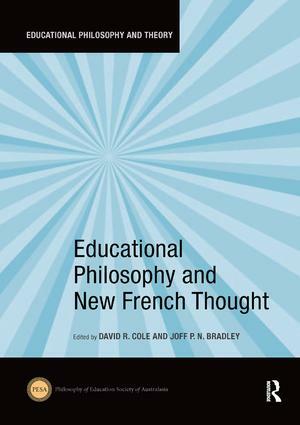 This book, while not exhaustive, takes the most pertinent aspects of new French thought, and applies them to the philosophy of education. In contemporary philosophies of education, the repetitions of evidence-based and neoliberal theories abound. This book serves as an antidote to the levelling off, and exhaustion in thought, that a capitalist takeover implies, while keeping sight of the crucial relationships between science, the arts and metaphysical speculation. Furthermore, this book represents a thoroughgoing thinking through of philosophy of education’s relationships with neuroscience, new scientific paradigms, feminist materialisms, anti-correlationism, technology and the socius, and as such constitutes a new philosophy of education. This book was originally published as a special issue of Educational Philosophy and Theory.